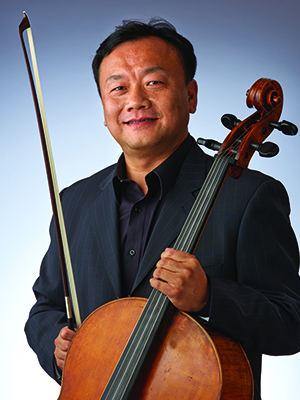 A native of China, Jian-Wen Tong began studying the cello at age 6. He was educated at the Shang-Hai Conservatory of Music and won a top prize in the 1988 National Cello Competition in China. His string quartet placed fourth in the Portsmouth International Competition in England in 1988. In 1989 he began his study with Eleanor Schoenfeld at the University of Southern California. He has been heard in many recitals around Southern California and as a soloist with the Burbank Chamber Orchestra and the Westchester Symphony and won second prize in the 1991 Irving Klein International String Competition. Before joining the Indianapolis Symphony Orchestra in September 1997, he was a member of the Pacific Symphony Orchestra since 1992 and the Grant Park Symphony Orchestra since 1993. Married to ISO violist Stephanie Tong, he enjoys computers, automobiles, traveling and watching movies.